North East Small Finance Bank Limited. 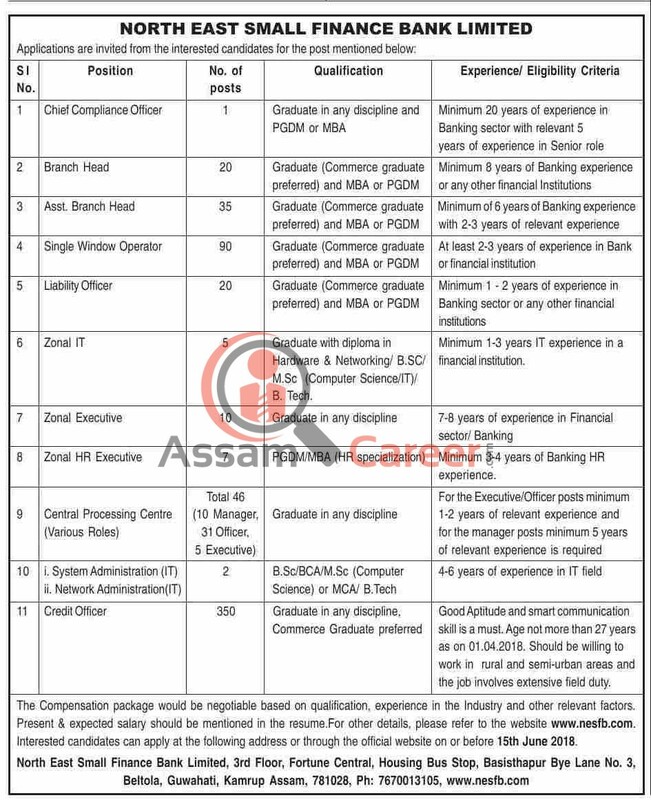 Applications are invited from the interested candidates for the post mentioned below under North East Small Finance Bank Limited. Educational Qualification: Graduate in any discipline and PGDM or MBA. Experience/ Eligibility Criteria: Minimum 20 years of experience in Banking sector with relevant 5 years of experience in Senior role. Educational Qualification: Graduate (Commerce graduate preferred) and MBA or PGDM. Experience/ Eligibility Criteria: Minimum 8 years of Banking experience or any other financial Institutions. Experience/ Eligibility Criteria: Minimum of 6 years of Banking experience with 2-3 years of relevant experience. Experience/ Eligibility Criteria: At least 2-3 years of experience in Bank or financial institution. Experience/ Eligibility Criteria: Minimum 1 - 2 years of experience in Banking sector or any other financial institutions. Educational Qualification: Graduate with diploma in Hardware & Networking/ B.SC/ M.Sc (Computer Science/IT)/ B. Tech. Experience/ Eligibility Criteria: Minimum 1-3 years IT experience in a financial institution. Experience/ Eligibility Criteria: 7-8 years of experience in Financial sector/ Banking. Experience/ Eligibility Criteria: Minimum 3-4 years of Banking HR experience. Experience/ Eligibility Criteria: For the Executive/Officer posts minimum 1-2 years of relevant experience and for the manager posts minimum 5 years of relevant experience is required. Educational Qualification: Graduate in any discipline, Commerce Graduate preferred. Experience/ Eligibility Criteria: Good Aptitude and smart communication skill is a must. Age not more than 27 years as on 01.04.2018. Should be willing to work in rural and semi-urban areas and the job involves extensive field duty. How to apply : The Compensation package would be negotiable based on Educational Qualification, experience in the Industry and other relevant factors. Present & expected salary should be mentioned in the resume. For other details, please refer to the website www.nesfb.com. Interested candidates can apply at the following address or through the official website on or before 15th June 2018. Address: North East Small Finance Bank Limited, 3rd Floor, Fortune Central, Housing Bus Stop, Basisthapur Bye Lane No. 3, Beltola, Guwahati, Kamrup Assam, 781028, Ph: 7670013105.